On the evening of April 9, 1937, two bandits with their guns blazing left a trail of carnage through the sooty streets of Mount Carmel and Shamokin. For one of the gunmen, the trail came to a bloody end in Diamondtown after a shootout with police. For the other gunman, the trail led to the electric chair at Rockview State Penitentiary, with 2,000 volts of electricity coursing through his body. 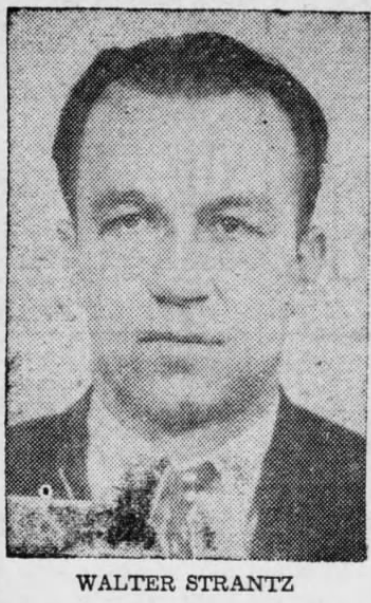 A reunion of sorts took place in January of 1937, after Joseph Yorkavage was paroled from the Northumberland County Prison in Sunbury. Known to his friends as "Joe Cabbage", the notorious ruffian was released on the 25th and, oddly enough, this was the very same day Yorkavage's best friend, Walter Strantz, was paroled from the infamous Eastern State penitentiary in Philadelphia. Back in 1919, "Joe Cabbage" was one of three men who staged a failed train robbery in Centralia. The three men dynamited the tracks and then hid in the bushes, intending to ambush a pay train coming through from the Lehigh Valley. The holdup never materialized; a young boy managed to flag down the train before it reached the smoking abyss where the tracks had been blasted away. This action resulted in an 18-month prison term for Yorkavage, and marked the beginning of long career in crime. It was around this time when Joe Cabbage "teamed up" with Walter Strantz, forming a two-man gang that dreamed of terrorizing Northumberland County. Strantz was a perfect match for Yorkavage; in 1932, he received an 18-month prison sentence for shooting Dominic Zakar, a local policeman. Together, on the evening of January 2, 1935, they robbed Arthur Hughes' grocery store in Mount Carmel. On January 18, the two men robbed a general store in Natalie. It was this robbery which led to Yorkavage's incarceration in Sunbury and Strantz's imprisonment at Eastern State penitentiary, and so it was only natural that the two bandits would reunite after their release and plan the wildest caper of their criminal careers. "My old lady's gotta die," explained Joe Cabbage to his friend. Yorkavage was referring to Katherine Crawford, the common-law wife who had abandoned Joe a week earlier. She left Joe and went to Shamokin, where she found employment as a housekeeper for Joseph Kerstetter, who lived in an apartment at 329 West Spruce Street. Yorkavage learned where Katherine was staying, and decided to pay her a surprise visit. It was Sunday when Joe went to Shamokin and implored his wife to return to him, but she refused. On Wednesday he came back again, threatening to kill her if she didn't return. Joseph Kerstetter convinced Katherine to go and see Justice of the Peace Harry Renninger, who swore out a warrant for Yorkavage on charges of assault and battery. Larry Grunaberg was the constable assigned to serve the warrant to Joe Cabbage. Grunaberg went to Yorkavage's boarding house in Mount Carmel on Thursday, where he was informed by the landlady that Joe wasn't home. The constable returned to Shamokin with the warrant unserved. Meanwhile, Yorkavage visited Justice of the Peace David Hughes in Mount Carmel, who telephoned Renninger and arranged a 7 o'clock evening hearing between Renninger and Yorkavage. Shortly after 5:30, Yorkavage and Strantz boarded a bus for Shamokin, presumably to appear before Justice Renninger. According to the driver of the bus, the two men drank liquor throughout the entire trip, and this was cause for concern, since it was obvious to the driver that the two men were pretty well liquored up before they bought their tickets. Instead of going to see Justice Renninger, the two men headed for 329 West Spruce Street. Katherine opened the door but, before she could speak, her estranged husband drew a revolver and shot her in the abdomen. 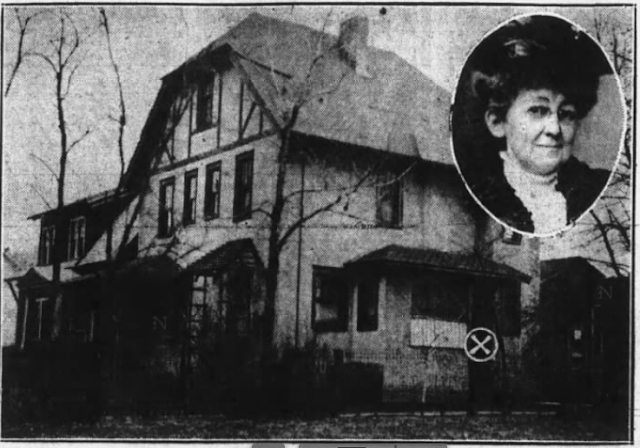 Constable Grunaberg was on his way to the Kerstetter apartment to accompany Katherine Crawford to the hearing before Justice Renninger, and arrived just moments after the shooting, the rancid smell of gunpowder still lingering in the air. He telephoned the state police and the local authorities, and they arrived in minutes with an ambulance to transport Katherine to the Shamokin hospital. Neighbors informed the officers that two men had been seen heading east down Spruce Street. Meanwhile, on Market Street, August Perembo sat in his car outside Red Man's Hall, having just dropped off his wife, Mrs. Harry Meredith and Mrs. Marguerite Leonard for a lodge meeting. Two men approached the car, and Auggie-- who was from Mount Carmel-- immediately recognized them as Strantz and Yorkavage. "How about a ride to Excelsior?" they asked. Auggie hesitated, but quickly changed his mind when both men drew revolvers and pressed them to Perembo's head. But the two bandits spotted a group on men heading toward Red Man's Hall, and thinking that they were a vigilante mob, they fled on foot. Yorkavage and Strantz made their way to the Rose Garden Cafe on Rock Street, where they purchased a drink and attempted to hire a car to drive them to Mount Carmel. They called Joseph Sands, who had a taxi stand at Independence and Cleaver Streets. It was around 7:30 when the taxi arrived. At Maysville, the bandits ordered Sands to stop the car at gunpoint. When Sands pulled over to the side of the road, one of the men struck Sands across the face with a revolver. They tossed the limp body of the unconscious driver onto the shoulder, got back into the car, and raced toward Kulpmont. 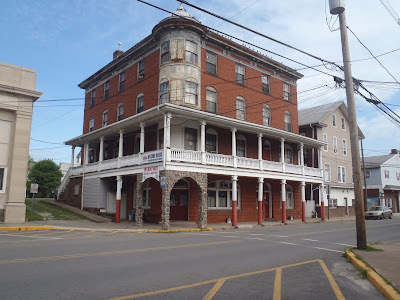 Sands crawled to Maysville Hotel and phoned the Kulpmont police. The police, however, were racing to the scene of a two car crash at the west end of Chestnut Street. One of the cars involved in the crash was Sands' taxi. The occupants, it seemed, had fled on foot; according to witnesses, they were last seen running down Scott Street. Burgess Hanlon, along with officers Lester Ferrari and Peter Ferrari sprinted toward Scott Street and sighted two men walking briskly. Burgess Hanlon shouted for the men to stop, but the two men ducked into an alleyway. Hanlon walked around back, very cautiously, but turned around to find himself staring down the nose of a revolver. "Beat it," snarled Joe Cabbage. The burgess and his two officers, all unarmed, hastened back to the station to grab their guns. It was then that they were informed about the shooting of Katherine Crawford in Shamokin, and it dawned on them that the men they had been pursuing for fleeing the scene of a car crash were Walter Strantz and Joe Yorkavage. By this time, the two outlaws had entered the saloon of Londo Avellino, at 600 Spruce Street in Kulpmont (locals will know this location as the building formerly occupied by Mirarchi's Market). They convinced Avellino to give them a lift to Mount Carmel, but Mrs. Avellino, who was in an adjacent room, overheard one of the men whispering to the other as Londo went to fetch his coat. "We'll knock him off along the road," Mrs. Avellino thought she heard one of them say. It was Mrs. Avellino's quick thinking that saved her husband's life; she insisted on going along for the ride, and throughout the trip she kept the two bandits distracted so that they never had an opportunity to pull off the highway. As the Avellino automobile was crossing the viaduct into Mount Carmel, Yorkavage ordered the driver to stop. "I have some business at the office of Justice of the Peace Hughes," said Yorkavage. Hughes was sitting in his office when Joe Cabbage entered the vestibule of the building, and the justice of the peace quietly called out to Constable Evert. "Here's Yorkavage now-- come and get him!" Yorkavage overheard the command and dashed from the building, shouting for Strantz to follow him. Evert phoned the Mount Carmel police, but the two outlaws evaded capture by streaking down alleys and hopping over backyard fences. "Give us two beers," said a voice to Earl Rowe, owner of the Second Street Cafe. It was around 10:15 in the evening. Earl turned around and recognized Joe Cabbage. "Hello, Joe! How are you?" asked the barkeeper. These would be the last words Earl Rowe would ever speak to a customer. 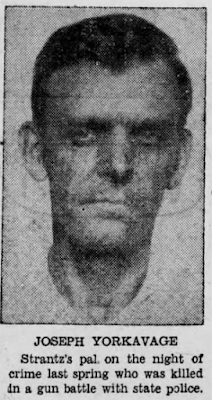 As Walter Strantz chugged his glass of beer, Yorkavage pointed his revolver at Rowe and shot him in the chest at point blank range. Rowe, clasping his quivering hands over the gaping wound in his chest, staggered along the wall toward the kitchen of the cafe. The bar's patrons stood aghast, while Joe Cabbage waved his gun in the air and warned, "Don't anyone move, or we'll plug you, too!" The two men then fled from the bar and ran east along Second Street. Rowe staggered into the reception room of his cafe, clasping his heart. His wife and son had come running when they heard the gunshot. "Earl! What's wrong?" "They got me," Rowe gasped. "They got me." Earl Rowe then collapsed and died. News of Rowe's murder spread like wildfire, and one of the greatest manhunts in Coal Region history was soon under way. Members of the manhunt included State Troopers Edwards and Burkholder, District Attorney Robert Fortney, State Highway Patrolmen Gray, Craven and Barclay, Sergeant Strough of the Hazleton State Police barracks, Patrolmen Stan Petzack and John Hamberger from the Frackville barracks, Special Officers from the Philadelphia & Reading Coal and Iron Company, the entire Mount Carmel, Kulpmont and Shamokin police forces, a policeman from Trevorton, and a number of local citizens deputized by Sheriff Albert Landis and Deputy Sheriff Lawrence Spriggle. But the crime spree was still in full force as the posse organized. It was reported that a gunfight had broken out in the Profits Saloon. Officers raced to the scene and found two men seriously wounded: Peter Profits, the owner, and his son Walter. Revenge may have been the motive; Peter Profits' wife was Joe Yorkavage's sister. The victims were rushed to the Ashland hospital. According to the son, neither of the bandits had said a word during their rampage; they merely burst into the saloon and opened fire. Owners of bars and cafes closed their doors early, fearing a visit from the blood-thirsty bandits. Meanwhile, more than 200 men took to the streets, armed with pistols, revolvers, shotguns and hunting rifles. The army of police officers commandeered vehicles from dozens of citizens and patrolled the area, in the hope that the marauders would attempt to carjack one of them. Shortly after 11:00, news came of another attack, this time at the saloon of Joseph Bach at the corner of Center and Chestnut. The bandits ordered two beers but did not drink them. They drew their revolvers and leveled them at George Bach (who was running the bar in his brother's absence) and Frank Jedris, the bartender. Joe Cabbage demanded all the money from the register. Jedris complied, handing over $46 to the gunmen. Strantz demanded a hammer, which he used to smash a piano in the corner of the room. The two madmen then fled the scene and went down the street to Wally Pincoskie's bar. They robbed Pincoskie of $200. Shortly before midnight, not far from the Mount Carmel Brewing Company's plant in Diamondtown, a man entered George Homiak's bar and purchased a large quantity of liquor, beer and sandwiches. One of the bar's patrons recognized the customer as Stanny Chesney, of 409 North Vine Street. Chesney was known to be friends with Walter Strantz and Joe Yorkavage; they had all worked together in a bootleg coal operation. The patron grew suspicious of Chesney's large order, and suspected that the two wanted outlaws might be holed up at Chesney's home. The patron passed this tip onto Trooper Cyril Edwards. Troopers Edwards and Burkholder, along with Sergeant Abe Morgan of the Mount Carmel police department and several officers from the coal company, descended upon the Chesney residence. The posse, armed to the teeth, surrounded the home. Snipers perched themselves on neighboring rooftops. As Edwards bravely marched up to the door, he heard a stampede of footsteps rushing to the second floor. Edwards and Burkholder rushed into the house; on the kitchen table were the remains of the liquor and sandwiches from Homiak's Bar. Edwards shouted for the men to surrender, but there was no reply. The posse was then instructed to open fire. Tear gas canisters were fired into the house through the second story windows, and ten heavy explosive charges were fired through the kitchen ceiling into the bedrooms above. Bullets whizzed by in every direction. This maelstrom of lead lasted for over an hour. Shortly after 1:00 in the morning, the posse had obtained what they believed was an advantageous position, with the two gunmen cornered in one of the bedrooms. Edwards negotiated with the killers, and one of the two outlaws shouted that he would surrender if the officers promised not to shoot. the promise was given, but still the gunman refused to come out. Edwards responded by pouring heavy fire into the door and wall as Sergeant Stroh maneuvered himself to a position near the rear window of the bedroom. Once again Edwards demanded the outlwas to come out with their hands up, and Walter Strantz complied with the order. Limping badly, he staggered into the hallway and into the arms of Special Officer Forrest Miller. But, as Miller attempted to search him for weapons, Strantz began to fight and was eventually subdued by Sergeant Morgan. Sergeant Stroh then entered the bedroom window from his outside position and disovered, seated on a char at the foot of the bed, the lifeless body of Joseph Yorkavage. the infamous Joe Cabbage had died as he had lived-- violently. Two bullets had entered his head; portions of his brain were protruding through the holes. Walter Strantz was executed in the electric chair at Rockview Penitentiary on February 7, 1938. He was pronounced dead at 12:34 a.m., less than three minutes after the switch was pulled, sending 2,000 volts of electricity through the condemned man's body. The final chapter of Mount Carmel's night of terror came to a close, resulting in two persons dead (three, if you count Joe Cabbage), four critically wounded and four holdups. Strantz died without issuing a final statement; he didn't even request a last meal. His body was claimed by three brothers and taken back to Mount Carmel. He is buried in Mount Carmel Cemetery.